Make repetitive and monotonous jobs more entertaining with this amusing clock on your desk. 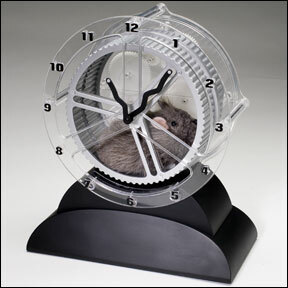 Watch as each minute the gray mechanical rat scurries on its treadmill to move the gears that advance the hour and minute hands. It is powered by 4D and 2AA batteries. Sells for $ 24.99 at Computergear.